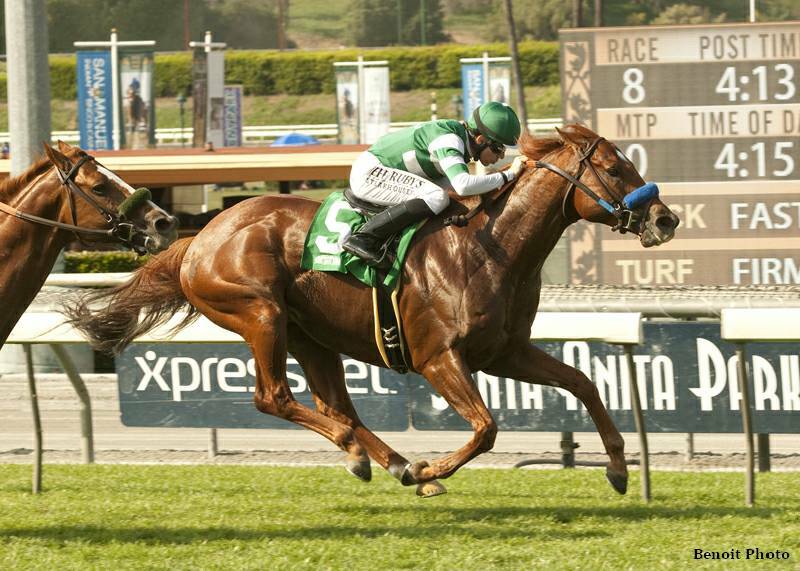 Sweet Swap's front-running victory in Sunday's Grade 3 San Simeon Stakes was the first graded stakes win of his career. The 5-year-old chestnut horse has now won six of 12 lifetime starts and has finished in the money nine times. Sweet Swap became the fourth graded stakes winner this year for his sire, Candy Ride, which moved the stallion into second, tied with English Channel, on the American Graded Stakes Standings sire list. Candy Ride's graded stakes winners this season have excelled on both turf and dirt, at distances ranging from 6 ½-furlongs to 1 1/16-miles. In addition to Sweet Swap, Candy Ride has sired Candy Boy (G2 Robert B. Lewis), Candyman E (G3 Toboggan), and Sugar Shock (G3 Fantasy). The San Simeon victory was trainer John Sadler's fifth graded stakes win of the year, keeping him securely in the top five on the AGS trainer list. In addition to the aforementioned Sweet Swap and Candy Boy, Sadler has appeared in the winner's circle with Iotapa (G2 Santa Maria), Kobe's Back (G2 San Vicente), and Vagabond Shoes (G2 San Marcos). Hronis Racing LLC, the owner of Sweet Swap, also moved back into the top five on the AGS owner list. The successful California-based stable has had three graded stakes winners so far this year, putting it in a tie for second with Jerry Hollendorfer. Hronis Racing has notched victories with Vagabond Shoes and Iotapa, in addition to Sweet Swap. This entry was posted in American Graded Stakes Standings and tagged American Graded Stakes Standings, candy ride, horse racing and breeding, Keeneland, sweet swap, thoroughbred, Thoroughbred Auctions, Thoroughbred breeding by Mary Schweitzer. Bookmark the permalink.